Who would've thought that a jersey bedding set could change the meaning of 'fresh sheets' Everyday feels like a fresh bedding day with the soft luxurious organic cotton bedding in beige melange from ECOSOPHY. I am so grateful to collaborate with this wonderful brand. I never would've believed that jersey bedding would be the best thing since sliced bread! I was so excited to try out the new bedding that as soon as it arrived I changed my sheets right away! Then I dived into bed... middle of the day! Just to try it out. Safe to say I didn't want to remove myself from the bed. Not only do i love the colour and simplistic style of this bedding set, I love how soft it is. it's like sleeping on a big ball of cotton, not that I've ever done that! It's rather heavy weight compared to what I was expecting, I thought the bedding would be light and flimsy but it's not. It looks and feels very luxe. And when your wrap yourself in a duvet burrito its the absolute bestest! I also feel I stay much warmer using this jersey bedding compared to my usual. it's also much more pleasant if you're a fidget, when the children visit my bed around 4am I don't even hear them sneak in anymore! Another thing I love about this bedding set is that there aren't too many buttons to fasten the bedding making it a nice quick task! A textile brand that creates organic, sustainable products that are thoughtfully designed. The name? ECO from the greek oikos meaning 'household' and SOPHY meaning 'wisdom'. This reflects their goal of helping consumers choose wisely, choosing ethical products for their homes. They use organic fair trade fibres. They use GOTS certified factory's. They use low impact GOTS approved dyes. The buttons use on their bedding are made from corozo nuts how cool is that!? The quality of this bedding set is incredible. It's very well made, washes well - I used a delicate natural detergent to help prolong the life of this bedding set. it's definitely worth the investment. Quality over quantity is always my motto. But I will certainly be upping my quantity of ECOSOPHY products! I can't wait for my babies to experience the ECOSOPHY bedding sets for their own bedroom! 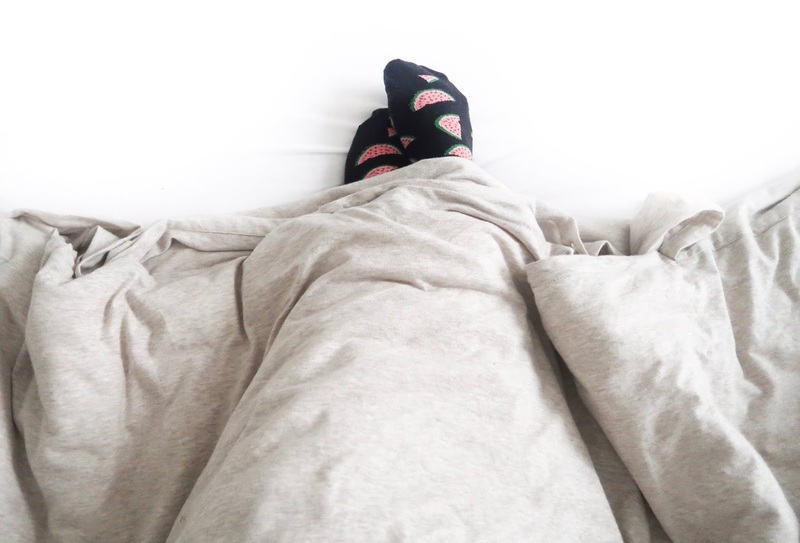 I heard through the grapevine that heavy weighted bedding can help children sleep better and though it could be a coincidence they have been sleeping in since I've been using this bedding! And my children NEVER sleep in! *This was a collaboration - all opinions and words are my own.